A new study by researchers from the UCSF Benioff Children's Hospital Oakland Research Institute (CHORI) shows that a modest 4 milligrams of extra zinc a day in the diet can have a profound, positive impact on cellular health that helps fight infections and diseases. This amount of zinc is equivalent to what biofortified crops like zinc rice and zinc wheat can add to the diet of vulnerable, nutrient deficient populations. The study, published in the American Journal of Clinical Nutrition, was led by CHORI Senior Scientist Janet King, PhD. Dr. King and her team are the first to show that a modest increase in dietary zinc reduces oxidative stress and damage to DNA. "We were pleasantly surprised to see that just a small increase in dietary zinc can have such a significant impact on how metabolism is carried out throughout the body," says Dr. King. "These results present a new strategy for measuring the impact of zinc on health and reinforce the evidence that food-based interventions can improve micronutrient deficiencies worldwide." The open-access AJCN article is titled “A Moderate Increase in Dietary Zinc Reduces DNA Strand Breaks in Leukocytes and Alters Plasma Proteins Without Changing Plasma Zinc Concentrations.” Zinc is ubiquitous in our body and facilitates many functions that are essential for preserving life. It plays a vital role in maintaining optimal childhood growth, and in ensuring a healthy immune system. 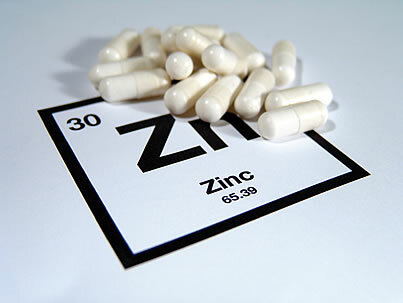 Zinc also helps limit inflammation and oxidative stress in our body, which are associated with the onset of chronic cardiovascular diseases and cancers. Around much of the world, many households eat polished white rice or highly refined wheat or maize flours, which provide energy but do not provide enough essential micronutrients such as zinc. University of Texas (UT) Southwestern Medical Center scientists have uncovered the chemical process behind anti-cancer properties of a spicy Indian pepper plant called the long pepper, for which suspicions of medicinal properties date back thousands of years. The secret lies in a chemical called piperlongumine (PL), which has shown activity against many cancers including prostate, breast, lung, colon, lymphoma, leukemia, primary brain tumors, and gastric cancer. Using x-ray crystallography, UTSMC researchers were able to create molecular structures that show how the chemical is transformed after being ingested. PL is converted to hPL (hydrolyzed PL), an active drug that silences a gene called GSTP1. The GSTP1 gene produces a detoxification enzyme that is often overly abundant in tumors. 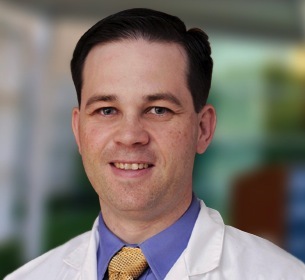 “We are hopeful that our structure will enable additional drug development efforts to improve the potency of PL for use in a wide range of cancer therapies,” said Kenneth Westover (photo), M.D., Ph.D., Assistant Professor of Biochemistry and Radiation Oncology. “This research is a spectacular demonstration of the power of x-ray crystallography.” The long pepper, a plant native to India, is found in southern India and southeast Asia. Although rare in European fare, it is commonly found in Indian stores and used as a spice or seasoning in stews and other dishes. It dates back thousands of years in the Indian subcontinent tied to Ayurveda, one of the world’s oldest medical systems, and was referred to by Hippocrates, the ancient Greek physician known as the father of medicine. Exosome Diagnostics, Inc., has recently presented data that sets a new standard for EGFR-T790M resistance mutation detection in lung cancer, with the highest sensitivity reported to date. This test is being developed to improve care and outcomes for the large population of patients who can benefit from second-line EGFR tyrosine kinase inhibitor (TKI) therapy but are missed with currently available tissue and liquid biopsy tests. Clinical validation data from a cohort of 160 patients, the largest of its kind in this patient population, was presented in plenary session during the recent AACR-EORTC-NCI meeting in Munich, Germany. ExoDx® Lung(T790M) has been optimally designed for ExosomeDx’s high-throughput biomarker testing platform that is being deployed in 2017. This news was reported in a press release from Exosome Diagnostics issued on December 21, 2016. Twenty percent of non-small cell lung cancer (NSCLC) patients test positive for an EGFR driver mutation (approximately 45,000 patients in the U.S. alone) and receive EGFR TKI therapy. Unfortunately, most will develop a resistance to EGFR TKI therapy. Tissue biopsies are the current standard for identifying T790M resistance. If a patient tests positive, they are eligible for treatment with a second-line EGFR TKI therapy. Unfortunately, a tissue biopsy is not always a viable option for a large percentage of these patients. Non-invasive liquid biopsies have emerged as a viable alternative for patients unable to have a tissue biopsy procedure. Clinical studies have demonstrated that the FDA-approved cobas® test for liquid biopsy, only identifies 59% of patients who will respond to a second-line EGFR TKI therapy. This is a direct result of lack of sensitivity and inability to test challenging intrathoracic disease. Researchers at the University of Rochester Medical Center in New York have developed a new imaging technique that could revolutionize how eye health and disease are assessed. The group is first to be able to make out individual cells at the back of the eye that are implicated in vision loss in diseases like glaucoma. The researchers hope their new technique could prevent vision loss via earlier diagnosis and treatment for these diseases. In a study highlighted in PNAS, Ethan A. Rossi, Ph.D., now Assistant Professor of Ophthalmology at the University of Pittsburgh School of Medicine, describes a new method to non-invasively image the human retina, a layer of cells at the back of the eye that are essential for vision. The group, led by David Williams, Ph.D., Dean for Research in Arts, Sciences, and Engineering and the William G. Allyn Chair for Medical Optics at the University of Rochester, was able to distinguish individual retinal ganglion cells (RGCs), which bear most of the responsibility of relaying visual information to the brain. There has been a longstanding interest in imaging RGCs because their death causes vision loss in glaucoma, the second leading cause of acquired blindness worldwide. Despite great efforts, no one has successfully captured images of individual RGCs, in part because they are nearly perfectly transparent. 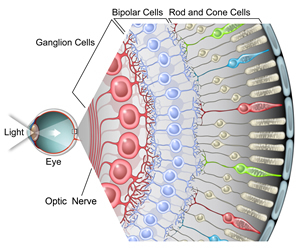 Instead of imaging RGCs directly, glaucoma is currently diagnosed by assessing the thickness of the nerve fibers projecting from the RGCs to the brain. However, by the time retinal nerve fiber thickness has changed detectably, a patient may have lost 100,000 RGCs or more. "You only have 1.2 million RGCs in the whole eye, so a loss of 100,000 is significant," said Dr. Williams. "The sooner we can catch the loss, the better our chances of halting disease and preventing vision loss."